Governmental violations of personal property rights drive much of the resentment, anger, and division we witness in America today. In 1925, President Calvin Coolidge famously said that the “chief business of the American people is business.” Today, however, this could be reworded as “the business of the American people is redistribution.” And government redistribution of income and wealth—violations of personal property rights—is tearing apart the social fabric of the country. The figure below shows transfers and federal taxes by household across income quintiles. The lower three quintiles receive far more in government transfers than they pay in taxes. Only the top two quintiles pay more in taxes than they receive in transfers, effectively subsidizing the bottom groups. This pattern is no accident; rather, it is a deliberate strategy by those favoring larger, more powerful government. The goal is to make Americans increasingly reliant on government transfers and less self-sufficient with a large and growing segment of the population who “vote for a living” and a shrinking segment who work for a living. Much of the division in America today reflects this redistributive dynamic. Hardworking middle-income and lower-middle-income families must have recognized that their efforts left them little better off than the growing number of recipients of government transfers. . . . [I]t is easy to see how a middle-income husband and wife who both work could resent that people who don’t work are about as well off as they are. 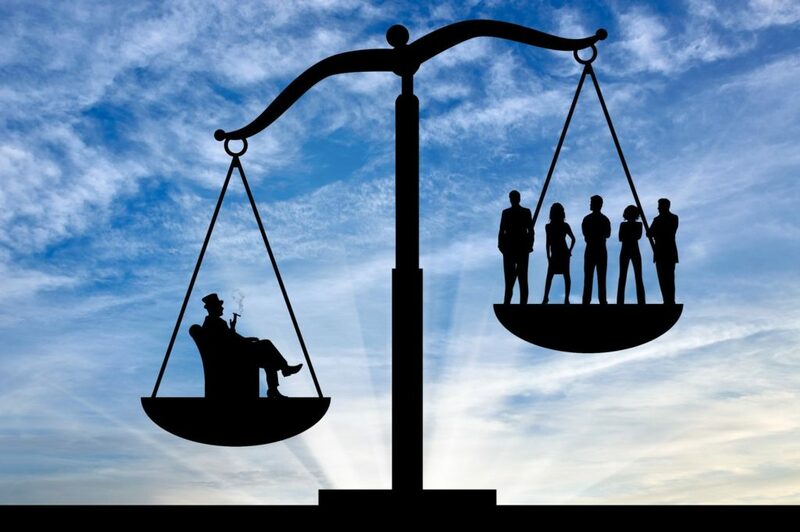 Over time, the unfairness leads Americans to view political investments (campaigning, voting, lobbying, crony capitalism, rent-seeking in general) as increasingly attractive compared to investing in themselves through education and on-the-job training or investing in their businesses through new plant, equipment, and R&D. At the individual level, a transfer mentality creates welfare dependency and weakens entrepreneurial initiative. Governments at all levels, through redistribution programs, have become the chief violator of personal property rights in America: taking income and wealth from one person and handing it to another while destroying the human spirit and social cohesion along the way. By Madison’s definition, governments at all levels in the United States are unjust. Governmental violations of personal property rights drive much of the resentment, anger, and division we witness in America today. Lawrence J. McQuillan is a Senior Fellow and Director of the Center on Entrepreneurial Innovation at the Independent Institute.